Splendor is a genuine jewel of a game – it sparkled brightly enough to earn itself a comfortable four shiny stars in our review. Fancy getting your hands on a few gemstones of your own? Let’s see if you can – there are a lot of facets to accessibility as we well know. Just because a game polishes up well from a game-play perspective doesn’t mean it’ll endear itself to the rich diversity of merchants interested in working the gem-trade. 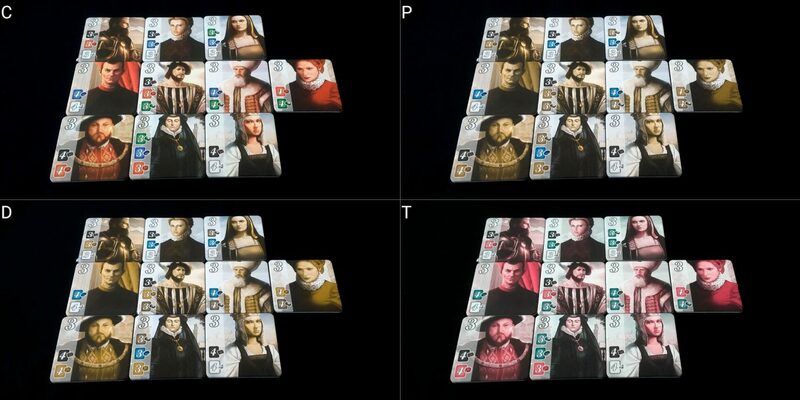 The nobles are marked with gem type as well as card colour on their tiles, meaning that even if you can’t see the colour you can match the icon to the cards and tokens you have available. Some of these icons are quite small though, and you might find it necessary to get a bit closer to see for sure what’s involved in purchases. However, there is nothing here that would interfere with play for those with any category of colour blindness, so we strongly recommend it in this category. Good work everyone. As per this comment, not every version of Splendor can be guaranteed to have the gem icons by the numbers, which would hugely limit its appropriateness for those with colour blindness. Also, thanks to that commenter, who is such a gem that they can probably be used to purchase nobles, the top of the review shows the version that’s actually being reviewed, with a link to Boardgame Geek. Bear this in mind when purchasing. There are some design problems in terms of visual accessibility. Being a card game with tokens, there is very little tactile differentiation between any of the parts. Gems all have the same poker chip tokens no matter what they may be, and the cards have no way to distinguish by touch or feel. Feels like a ruby to me. Or an emerald. A sapphire? God, I don’t know. For those with minor to moderate visual impairments, the contrast on some cards is not great – especially when dealing with diamonds and victory point counts. It’s not game-breaking, but the contrast is still pretty bad here. Some cost icons too may get lost in the art-work, making it difficult to make out the type of gem involved in the purchase. Not always, and not even very often, but occasionally. It strikes me as likely down to the difficulty of checking every combination of art, cost and gemstone more than a genuine oversight given how much consideration has been given to the rest of the visual aesthetic. In most of the cases when this occurs, it’s possible to tell based on deduction what gems must be involved. Again, not game-breaking but you can see the onyx cost on the right hand card has poor contrast against the background art. In terms of actual visual parsing of the game state, it’s a more nuanced story. A lot of Splendor is mapping out a path to procurement of the cards you want based on the supply of gems, the cards your opponents are likely to want, and your own dwindling finances. There are twelve cards that must be considered at one time, and each of your opponents will have their own economic engine you’ll need to take into account when making choices. However, the set of game data is entirely open – nothing is done secretly. It’s possible to memorise key pieces of information and play meaningfully provided you have someone willing to ensure specific questions can be addressed. It would involve playing at a disadvantage given how intricate some strategies may be, but it would be possible. We recommend Splendor in this category. Of these, reserve a card is the only one that puts any serious burden on cognition since it requires both remembering purchasing it is an option and building up a strategy to procure it. Reserving cards defensively too needs an assessment of strategy that is heavily dependent on memory and fluid intelligence. However, the token collecting rules also have a degree of conditionality to them. If there aren’t enough colours to make them all different, you can only take as many as there are discreet gem stacks. You may be prevented from taking two tokens of a single colour if there aren’t enough in the supply. The conditionality is relatively simple, but still adds a compound burden onto cognitive processes. The strategy in Splendor is deep and involved and requires a fair degree of cross-player analyses against the common shared state of supply and marketplace. That’s if you’re playing to win. 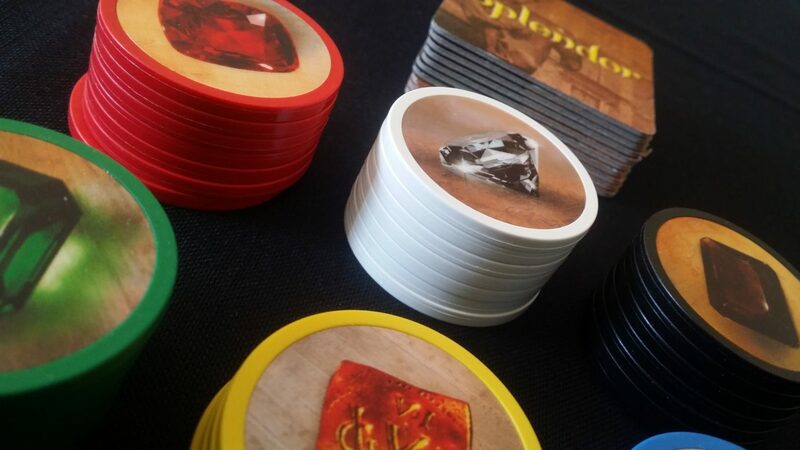 With Splendor though there are numerous satisfying house rule variants that might be adopted to allow meaningful co-operative play. We might consider a set number of turns in which the intent is to maximise a shared score, or simply working on the basis of the economic engine part without a major victory point component. The act of engine building is inherently satisfying, and so non-competitive variants will still offer much relaxing fun if the strategy of the game proper is likely to be a barrier to play. Broadly it’s a positive story here – there is no reading level required, the game state is not complex even if it is deep, and all game information is represented out in the open which minimises memory burden. The game flow is consistent and reliable, and even the occasional procurement of nobles fits into the rhythm of play. You make your action, you check the nobles. There is no way to subvert this game flow, increasing the game’s learnability. There are only a handful of tokens, no complex rules synergy, and a simple scoring system. The only area of concern is in the simple arithmetic the game requires – whether you think of supply cards as ‘bonus gems’ or ‘discounts’ it still involves some addition / subtraction and working out which cards you can buy based on the resources you have. Some degree of numeracy will be required for anyone to play without support, but the level is very low. 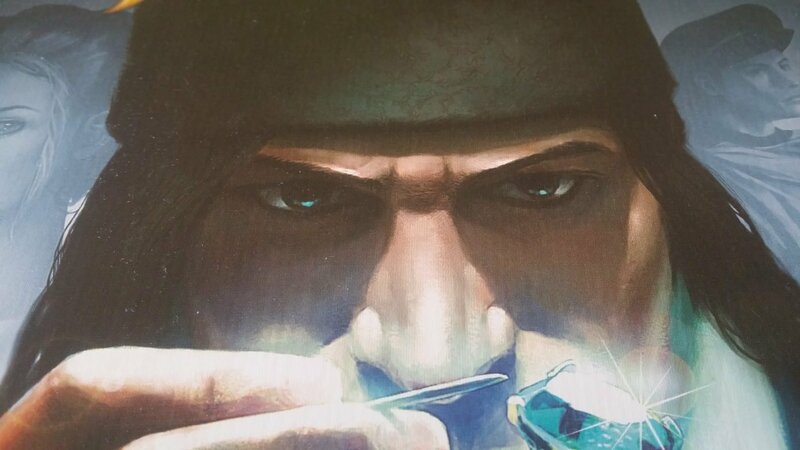 Splendor begins as a relaxing game but rapidly ramps up into something more cut-throat. There is a considerable sense of frustration to seeing the card you had built your plans around disappear from the marketplace, and it can be especially infuriating to know that it’s being done defensively as a reservation. It’s extremely difficult for any one player to block progress for another in the long term, but it is rather easier to setup up temporary obstacles that slow progress. You’re always left with options on your turn, and there are always alternate strategies available to you if your plan is thwarted. That may be slim comfort if the alternative route is punishingly expensive to follow. This can be exacerbated by the length of time between turns – each turn is relatively snappy in itself, but a considerable amount of thought tends to get invested into later turns as the end-game rapidly approaches. It can be tense watching someone hum and haw over the cards they can get before finally, after a minute of your waiting for the shoe to drop, they pick up the card that you desperately needed. Coupled to this, the design of the game encourages a certain degree of collaborative ‘king-unmaking’ when one player gains too great an advantage. In a two player game this isn’t going to be an issue since each player has equal ability to upset the other. In three or four player games, the length of time between your turns means that you may have been the victim of multiple actions that undermine your strategy. If you’re obviously going for sapphires for a noble, you may find all the affordable ones bought or reserved before you get a chance to do anything about it. When you buy a development card, you place another one down in its place – if that’s one you really needed you may find it falls out of availability before you can do anything at all about it. That can seen awfully arbitrary. Similarly, it’s possible that gem tokens you need will be gone from the common supply by the time your turn comes around. That has the effect of locking you out of your desired development. You can always reserve a card for a wild-card token (assuming any of those are left), but the pace of acquisition in that strategy is glacial. There aren’t any explicit ‘take that’ mechanics, but there are numerous implicit strategies that have the same effect. There’s no specific need for bluffing or lying in the game, but there is a definite strategic component that can come from misleading other players as to where your attention is focused. To show too much interest in a particular card is to invite your opponents to remove it from your grasp. There’s also a good deal of reading your opponent that goes into good tactical play. To know what your opponents are going for is to your own opportunities for counteracting their strategies or taking advantage of their attention being directed away from the cards you want. In that respect it’s a lot like poker, except that everyone’s hands are visible and the cards that you’re working with are out in front of everyone. I don’t think ‘people reading’ is critical to effective gameplay, but it’s certainly a useful thing to be able to do if you want to maximise your chances of success. 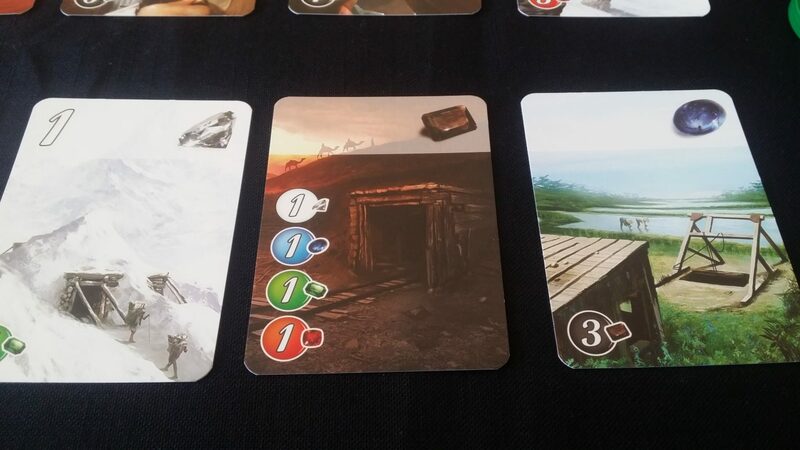 The ramping up of game pace which we talked about in the review creates an awesome sense of escalating tension throughout play, but it can happen without warning and be concluded in a couple of turns. That means if you didn’t make some progress towards attaining victory points you may find yourself with only a few when your opponents are on double digits. If you’re not careful, the end of the game will happen without your input and long before you’re ready. However, the fact it *was* happening was part of the open game state, and if it happens without your awareness it’s usually because you weren’t paying enough attention to what everyone else was doing. For a particular kind of mind-set, it can be hard to interpret this as anything other than a personal failing. The point disparities that come along with this aren’t numerically large (fifteen is the winning threshold, after all) but can be contextually large enough to make someone feel stupid and angry for their poor performance. This game will not work well with certain kinds of emotional and behavioural disorder. However, a lot of this can be managed by the proper playing context – the games are quick and improvement in play can be rapid, so the cost of losing isn’t especially high. You can get four or five games of Splendor under your belt in the same time it might take for a single game of, for example, Concordia. As long as you’re not playing with a bad winner, and you’re playing with a group that will put the collective fun ahead of their own, there’s no reason to be overly concerned with the emotional impact of the gameplay mechanics. We recommend Splendor, just, in this category. There is quite a lot of hand management that goes into the game, largely centred around organising your various development cards into matching sets to simplify the economic calculations. There’s also quite a lot of physical movement in terms of picking cards out of the marketplace, collecting tokens from the supply, returning tokens to the supply and claiming nobles. None of it is especially complex, but every turn you’re likely to be doing something physical when interacting with the game. The cards are of reasonably good stock and of approximate poker-card size. There’s not a lot of shuffling required – three decks at the start of each game, and that’s it. Cards are usually played face up in front of you, so there’s no need to physically hold the growing state of your deck in hand. There’s no necessary contiguity to the game state, other than showing from which deck particular cards in the marketplace were drawn, The distance between the main interaction areas can be minimised considerably in a two player game, and reasonably optimised for larger player numbers. A special note of commendation should go to the poker chips that are part of the game. True, they are round and thus not necessarily the easiest thing to keep hold of for those with certain kinds of physical impairment. However, they are weighted, solid, reasonably large and far easier to manipulate than fiddly cardboard tokens would be. We recommend Splendor in this category too. There are no barriers here with regards to communication or reading. If you want to stare intently at everyone in silence while they uneasily try to make small-talk, nothing need stop you. How about that weather we’ve been having? 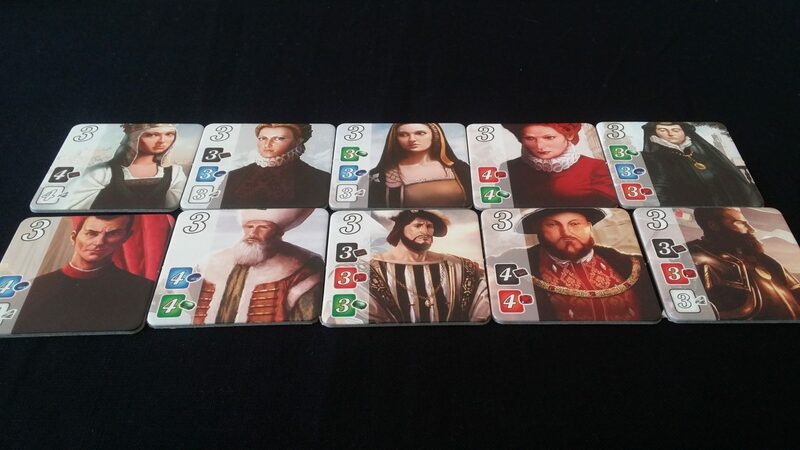 Splendor offers a balanced provision of nobles in the box, and has only one area with overtly gendered artwork. None of the noblewomen are explicitly sexualised or represented as anything less than the noblemen. The manual too has no assumption of masculinity, and retains a gender-neutral approach throughout. I say, that chap with the big hat looks suspiciously ethnic. Run that rum cove out of town, what what. 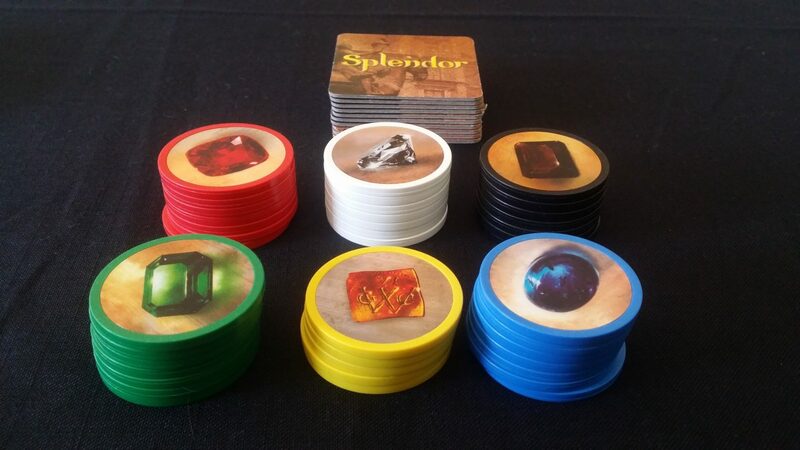 Splendor is a reasonably affordable game, with an RRP of £25. There’s not a lot in the box, but you do get some very nice quality components. It supports two to four players and scales well at all levels. With a ceiling of four players though it won’t be great for large families if everyone is to be part of the fun. It has a reasonably good ‘cost per player’ value though, and if you’re going to be able to schedule the right number of people you won’t resent the money you paid for the box. Splendor is recommended in this category as well. For those with visual impairments and memory impairments, the need to memorise game state to a degree will significantly impact upon ease of play. The more severe the visual impairment, the more that needs to be remembered. It’s certainly possible to memorise the neccessary portions of the game for those without cognitive impairments, but it’s on the verge of what would be considered a reasonable burden at the best of times. For those with physical and communication impairments, the accessibility of the game is going to depend significantly on the nature of both. As mentioned above, there isn’t a huge amount of physical interaction required, but there is *some*. Much of the day to day administration of play can be handled by any random player without game impact. Being able to indicate what should happen on your turn requires either some degree of ability to physically interact with the game state or to communicate intention. The game zips along at a brisk pace, with its twenty or thirty minute play-time short enough to ensure it doesn’t exacerbate physical or emotional distress. Ability to drop in and out is limited, but there’s no serious inter-player dependency in the rules and no way for purchased cards to make their way back into the supply. When something has been purchased, it’s yours for the entire game. Nobody else will get a chance to acquire it later. As such, there’s no game impact for a player removing their participation in an otherwongoing recycling of resources. This isn’t true of tokens, but they can be returned to the supply if someone is going to be out of the game completely. The tension of downtime between turns is compounded by the need to pay close attention to what’s happening around you for effective strategic play. For those with emotional and cognitive impairments, this can create problems if holding attention is an issue, or if impending misfortune is difficult to emotionally manage. Much of Splendor is a game of delayed gratification, and often that gratification isn’t so much suspended as entirely revoked. 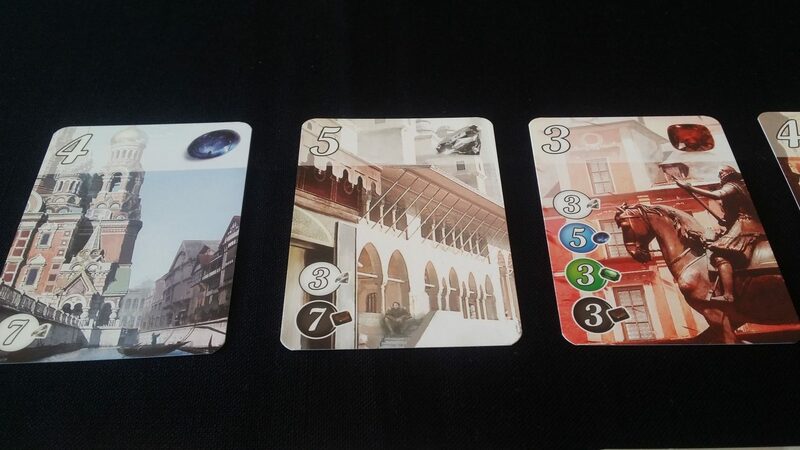 We gave Splendor a glistening four stars in our review, because it’s thoroughly enjoyable. It’s easy to learn, but with deep crevices of hidden depth you can invest many hours in exploring. It also turns out to be very accessible from almost any angle you look at it. Its problems, such as they are, tend to be either missed opportunities (a greater blend of ethnicities would have made it considerably more inclusive, and at zero cost to the game theme) or highly dependent on the specifics of individual context (such as in its emotional accessibility). A few minor tweaks here and there could do wonders for addressing the rest. Out of the box though, we’d have no qualms in recommending this to almost anyone. 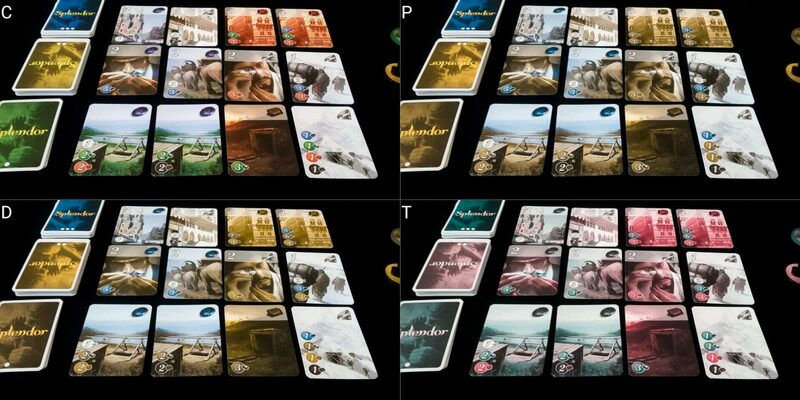 Which version of Splendor are you reviewing? I’ve never seen the gem icons next to the colours before, so the version I played wasn’t colourblind friendly. Thanks for the headsup here – I’ve put a note into the text about that, and I’ll try and hunt down some useful version information. Probably something well worth doing for all reviews, although in general it’ll be ‘the newest edition that Amazon is currently selling’.